It’s pretty tough to sum up the last couple of days in a little blog report. The Games have surpassed my expectations. I don’t mean this in terms of my own performance, but the event as a whole. Doing a multi sport games is so different than going to a bike race. 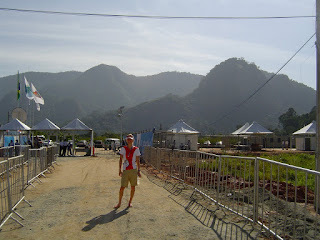 There were over 5000 athletes in the village from the 42 countries in Pan America. Each morning the cycling crew would head to the meal hall decked out in our Canadian clothing and walk by people training on roller blades, bicycles, in soccer teams, and running groups. Each athlete, manager, coach etc was decked out in the colours of their countries. All around us were the banners of our sports and the flags of our countries. 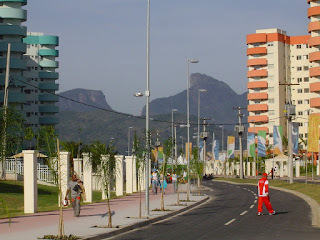 Each building contained athletes from one country and was covered top to bottom with flags. 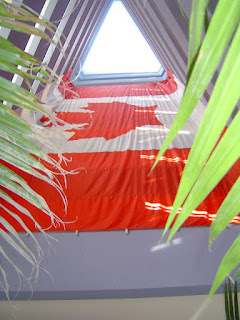 The interior of our building had a Canadian flag that was 10 stories high and filled the inner balconies. The athletes had their own lounge where they could go on the internet, make phone calls watch tv, play foosball or just relax with other athletes. I got to learn so much about other Olympic events like Open water swimming –which appears for the first time in Beijing, shooting, fencing… It was fun to talk and see what the typical summer and travel schedule of a national team swimmer was like compared to a soccer player, which countries they get to experience. The opening ceremonies were Friday night and the mountain Bike race was Saturday morning so unfortunately I did not get to experience that, but the Games still felt rich with experiences. Thursday evening our Governor General stopped by the village to attend Canada’s Flag ceremony and give a speech. 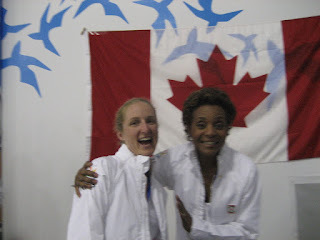 I was then invited to join with her and several other athletes to have dinner and mingle and of course take some photos. One of the frustrations of the games for an athlete used to being very independent and determining their own travel plans and schedules is the enforced structure of a Games. Rio being the 3rd most violent city in the world was pretty protective of the athletes. This meant I couldn’t bike anywhere by myself and our only riding options were the race course and a 3km loop of an F1 race track. This meant taking the bus to my event as the guys raced much later and none of the staff had bikes to go with me. So at 6:40 am, me and my 5 staff team headed to the mtb venue. Our mechanic Peter was awesome and had my bike dialed for the race. We were also assigned a therapist to be on site with us as well as our coaches and soigneur to handle the two feed/tech zones and representation. The race loop was super fun. The ground was a mud/sand combo which was horribly sticky when wet, but hard and fast in the dry. After a fast start loop we headed immediately into the woods and up a steep climb made technical by a slick rock and several roots. 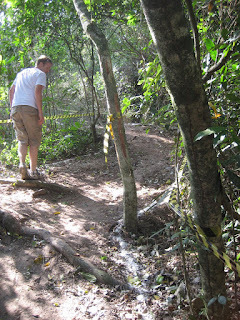 The course wound its way up and down a forested hill several times offering many sharp corners and roots. We had one sustained climb of 2+minutes and a large section of over 1km of flat ground which lead back to the start finish. The course was approximately 6km and the women were given 5 laps + 2start loops. Warming up was a bit of a challenge as I was warned to avoid all favellas (poor looking housing) as they may be inhabited by gang members. The only road available was really busy with traffic and pedestrians. On top of this I had a film crew trying to follow me and get some footage. When the Horn blasted the start of our race we all took off. Mary moved to the front and I dropped back to 5th not being able to clip into my pedal and wanting it for the upcoming jump. The paced seemed slow so when the course opened I jumped to the front to lead the 2nd loop. Before we hit the woods however Mary overtook me and entered the single track first. She slipped on the slick rock and we all hoped off our bikes to run the first climb. After that it was me following Mary trying to see where I could gain an advantage. She seemed to be struggling on both the technical climbs and the descents so I focused on riding cleanly. On the flat stretch she was able to open some time on me, but I knew I could make it up in the woods if I kept focused. Sooner than expected on the first descent I came a round a corner to see that Mary had laid her bike down. She was up in front of me, but now I was determined to get by. The next opportunity I went to make my pass. As I did I got a stick caught in my front wheel. An annoyingly slow pass, but I got by and stepped on the gas going into a series of little climbs. I looked back on the longest climb and I had dropped Mary. Excellent! It was back into a good series of technical climbing and descending before heading back out onto the flats. Mary would claw in a couple seconds on the flats and I would put time into her in the woods…. excepting 3rd lap where I made a bunch of mistakes. Things were going well for me. I knew I could win this race, but was glad it was actually happening. Last lap and I was given a report that Mary had burped her tire and had to pit for a quick fill up. I had over a minute at this point, but when you’re going for gold you’ll take all the breathing room you can get! I rode into the finish zipping up my jersey and thanking the flat surface so I could raise my hands and look like a pro without falling on my face! My team was there to meet me at the finish with the most amount of media I’ve ever been exposed too. There were photographers, film crews, reporters with recorders and memo pads, you name it. I was told at this time that not only was I Canada’s first medal, but the first medal of the Pan AM Games. How cool is that! When Mary (USA) and Laura Morfin (Mexico) crossed the line we were escorted towards the podium (with our doping control chaperones in tow). After the podium, flowers, medals, many, many photographs and interviews we were then escorted to a press conference where the three of us and some translators did a tri-lingual press conference. 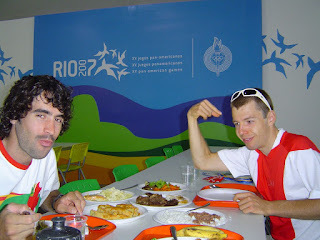 After this we were finally able to go pee…in front of our doping control chaperones. Although I had had little to drink after the race I was still too dilute from race hydrating and was told I would have to go again, but that I wasn’t allowed to eat or drink anything until that time. Luckily they relented on the no food, but held tight to the no beverages. Yes I did get a wicked dehydration headache and felt sick to my stomach from the heat all through the night. Finally I was released and got to go watch some of the men’s race. Unfortunately Ricky was already out with a slit sidewall and Matt was working his way up after a flat tire. Interviews by phone and in person continued the rest of the day and up till 10pm. The head of the COC even let me borrow his cell to call home. Wow way to feel like a superstar. The reality of the day sunk in more and more. It wasn’t just another race. We got back to the village around 4:30 and starved and sun burnt headed to the food hall. Each evening medal winners are called together to be recognized for their achievements. That night I stood with two other Canadians. Each had won a bronze, one in open swimming and the other in Taekwondo. Congrats on your huge win at the Pan Ams!!!!!! You Rock! Yvonne and Greg from The Loops! Congratulations Catharine! Way to ride! Your photo was on the upper corner of our Globe and Mail front section, the cover of the sports section and a big photo on the third page. You definitely deserve the attention, you've obviously worked very hard for this and it's paying off. Enjoy! Hola Kika!!! Fue muy emocionante verte en el podio!!! Mas encima en la television de mi casa!!!! Te felicito por el oro logrado en los panamericanos!!! Muy bueno!!! Espero verte nuevamente y podamos salir a andar en bicicleta juntos aqui en Chile o en Canada cuando vaya por esos lados. Creo que Chile esta postulando para hacer los Panamericanos de MTB el año 2008 asi es que esa podria ser una opotunidad para que conocieras Chile y mis mejores lugares. Bueno Kika muchas felicidades por tu medalla y estamos en contacto.Eduardo. Muddddy!! But the Pendrels Like it!